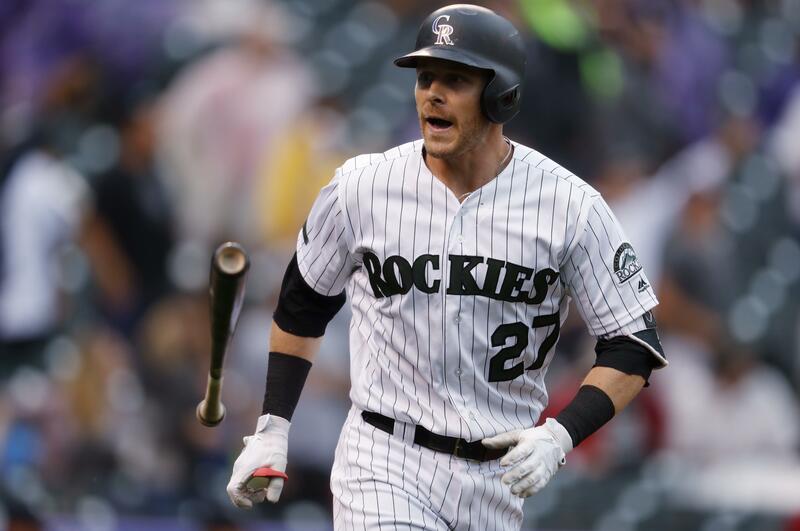 DENVER – There was no question that the ball was going out when it left the bat of Trevor Story. Given the park, the hitter and what has been transpiring for the Mariners, it was only a question of how far. The answer: Not even close enough for center fielder Ben Gamel to make a hollow effort at a game-saving catch. Story’s walk-off homer in the bottom of the ninth gave the Rockies a 4-3 win on Sunday and sent the Mariners reeling, stumbling and tripping into the All-Star break. Yes, the Mariners had a brilliant first half of the season. But these last 11 games, in which they lost eight, including being swept in this three-game series at Coors Field, was a reminder of mediocrity past. Panic? Maybe not. But this was a reminder that the Mariners and their postseason hopes are far from guaranteed. Mariners starter Mike Leake did his job, bouncing back from two less-than-stellar outings. He pitched six innings, allowing two runs on six hits with a walk and two strikeouts. He probably could have kept going if not for his spot in the order coming up in the seventh inning with a runner on second. But Seattle’s failure to hit at a park that rewards hitters cost them the game. And this recent anemia at the plate isn’t limited to just this series, but also the prior two series that they lost. The Mariners grabbed a 2-0 lead in the first inning against Rockies starter Tyler Anderson. Consecutive singles from Dee Gordon, Jean Segura and Mitch Haniger led to the first run, giving Haniger 67 RBIs before the All-Star break. With two outs later in the inning, Denard Span doubled into the gap in left-center to make it 2-0. From there, Anderson settled in, retiring 14 straight batters and working six innings, allowing just those two runs on five hits a walk and six strikeouts. The Rockies answered in the third inning, scoring two runs off of Leake. A two-out walk to D.J. LeMahieu started the problems. Charlie Blackmon followed with a broken-bat single to center and Nolan Arenado singled to right field. With the wet conditions, Haniger dropped the slippery baseball as he went to throw and then stumbled on the soaked turf. It allowed both runners to score. Seattle grabbed a brief 3-2 lead in the top of the seventh against lefty Jake McGee. Guillermo Heredia led off with a single and moved to second on David Freitas’ sacrifice bunt. After pinch hitter Nelson Cruz struck out swinging, Gordon delivered with two outs, lacing a single on a 3-2 pitch to left to score Heredia. But Juan Nicasio gave the run right back in the bottom of the inning. A lead-off triple to Ian Desmond in which Haniger fell down on the soaked turf eventually led to a run on Chris Iannetta’s sacrfice fly to left field. Published: July 15, 2018, 4:18 p.m. Updated: July 15, 2018, 5:08 p.m.